Grades 3-12 (grade completed by Camp time) with priority placement given to grades 4-12. We accept all campers according to the gender and grade quotas we have set for that year’s Camp. In other words, we accept so many 5th grade girls, 8th grade boys, etc. We strive for a balance of the grades and genders. This is the first and primary rule we use and it takes precedence over all other secondary rules. All Applications received on or before April 1 are treated equally as far as the date received is concerned. This is done to equalize the opportunity for all to apply. Applications from returning campers and their siblings received up to April 1 will be accepted into the Camp first. All remaining campers will be accepted on an earliest date received basis. If multiple campers are equal as far as date received, preference is given to the camper who was on the waiting list the previous year. Waiting List – All campers who are not accepted are placed on a waiting list and are contacted as soon as we have an opening on an earliest date received basis. Please do not contact us. More information is listed below. Usually we have more campers to apply than we can accept. If you are not accepted, you will be notified that you are on the waiting list. As soon as we have an opening, we will contact you by phone. If time permits, we will leave a message with a time limit for a returned phone call. If time does not permit and the phone is not answered, we move to the next person on our Waiting List. So during the few days between public notification of the Waiting List and Camp, please answer your phone. Please do not contact us for more information about your waiting list status. If you are not ultimately accepted, all of your money will be refunded. For more information, See FAQ. Check out the many things that you can do, a different thing each day, Monday through Thursday. You rank your choices in order of your preference. Usually you can get most if not all of the things you want to do. There is something cool for every one, every day. When you fill out your application, you will be able to choose your preference of which activity/craft you would like to participate in. To help you to choose, you can download this pdf file or read below. Learn new songs or sing old favorites. You won’t be disappointed. You can participate all 4 days if you like. The sport, practice or skill of using a bow to propel arrows at targets. Your targets may be enhanced with balloons. Team sport. Need at least 3 – 5 on each team. Come get your dribbling and shooting fun and compete with other teammates. Anyone up for competition? Fast paced games available in air condition comfort. Crazy for chalkboard projects? Come use some of the trendiest crafting tools. You can learn how to do the lettering on those projects. It’s all the rage. Color your choice of beautiful illustrations, pictures of animal, flowers, or paint your favorite rock. Very calming and satisfying. Try your hand at acting. Meet with others who want to perform on stage. Bring your props. We have stencils, paints, etc. for you to use on your own t-shirt or pillowcase. You might also want to make a unique bracelet out of an old t-shirt or bandanna. Fishing is the practice of catching or attempting to catch fish with a hook that is generally known as angling. You can always return the fish to the water. This is called GPS stash hunting. Someone “buries” something for you to find using a Global Position System receiver. It’s really a new take on a treasure hunt. Very enjoyable outdoor activity. You will be the hippos with a friend to guide you to catch the balls. Scooter, baskets, balls and friend are your equipment. The Newshound, Camp newspaper. Written daily by you about what’s happening at camp that day. If you want to try reporting, this is your chance. Bring your camera or use one of ours. Your cell phone’s camera is acceptable only for this activity. Reporting for the camp newspaper is your assignment only with pictures. Opportunities abound to make a splash for yourself with your candid shots. New targets. This will be a challenge to see how good you are at hitting your target. Draw or trace or copy any image onto a Shrinky Dinks sheet, then bake. Fascinating. You may also want to make a project using Perler Beads. The designs and ideas are almost limitless. Slingshot challenge! Can you do it! Surprise ammunition. If you like fast paced games, bring your energy to play these games. You will not be disappointed. Ms. Peggy’s stories are not to be missed. She has a way with words and a fantastic sense of humor. You get to tell your stories too. Pins and thread art. Using an arrangement of colored thread strung between points to form designs. Write or design pictures. NEW games this year including blanket balloon toss, The Great Jungle Fire, Tank, Wet Shirt Relay and a special surprise game. Using simple wood burning tools and easy techniques to help you add designs to a bare wood project. Aluminum canoe sports include paddling and balancing in a boat while moving fast across open water. Of course, your canoe mate should be as coordinated as you are, or you are all likely to end up in the cool wet water. Sign up if you are 7th grade or higher. Come just for fun or compete on a 9 hole Frisbee Golf course. Lowest score wins. Come experience physical and mental disciplines. No napping here! Learn yoga exercises that will help you lead a healthy active lifestyle. The bus picks up on Sunday AM and returns to the same location on Saturday PM. On Sunday, the bus stops for worship services and for lunch arriving at the Camp around 3 PM. On the return trip on Saturday, the bus stops only for lunch. If there is insufficient ridership to charter the bus, you will be notified and your bus fee fully refunded. You will be dropped off after Camp at the same bus stop where you were picked up before Camp. No changes to the drop-off stop can be made without a note signed by your parent or guardian. Change Medical Form/Medicine – If needed, bring your completed and signed Change Medical Form and give it to the bus chaperone. If you are bringing medication that will be given by the nurse, please pack it in your luggage for easy access. You will give your medicine to the nurse at Check-In. Meals – Bring $14 cash which will cover 2 meals, one going and one returning. Have your money in your pocket or your purse — not in your luggage. Sunday Night Supper – Bring a sack lunch for Sunday night supper at Camp. Sunday Dress – On Sunday, dress appropriately for worship services. After services, you can change into Camp attire. Luggage will be inaccessible while packed on the bus. Please bring the clothes you wish to change into in a small bag or sack. Your things – When leaving the bus at Camp or returning to your home, please take all of your belongings with you. Items left on the bus are usually not retrievable. If you need to pick up your child at some other time than the scheduled closing time on Saturday morning, please notify us in advance. Then you must first come to the Office (in the cafeteria); identify yourself and inform us that your child will be leaving. We will only release the child to a parent or an adult that has been properly authorized by a parent. If more information is needed, contact the Camp. 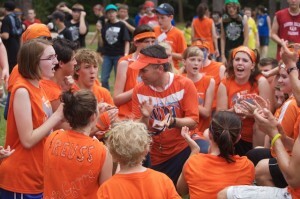 It is the purpose of the camp to create an atmosphere permeated by the values and love of Christ. Each camper is expected to follow the rules of the Camp and to respect the counselors’ instructions. Campers are to wear modest clothing. Please, only modest necklines and arm holes. No one is allowed to wear tank tops, muscle shirts, midriff shirts or very tight fitting clothing. Loose fitting walking shorts, pants, or skirts coming to the kneecap are permitted. We do not regard our dress code as the absolute standard of right and wrong, but a balanced approach at harmonizing many diverse opinions. If adhering to this standard is not what you are willing to do, please do not apply to the Camp. Your daily camp attire is suitable for all activities, thus eliminating the need for frequent dress changes. Please do not over pack. There is very limited space in the cabins. No use of tobacco, any smoked substance, alcohol, or non-prescribed drugs, possession of weapons or abuse of camp facilities is permitted. There is no mixed swimming. Modest attire must be worn to and from the pool. Proper relationship between boys and girls is to be maintained at all times. Online applications accept only credit or debit card payments. Payment options are 1 full payment or multiple installment payments. If you choose installment payments, each installment will be automatically charged to your credit or debit card. Before May 7, all fees are refundable except a $25 per camper application fee. After May 7, all fees are refundable except a $50 per camper cancellation fee. After June 1, there is no refund. If you are not accepted into the Camp, all fees will be refunded after Camp. Please help a young person come to Camp! 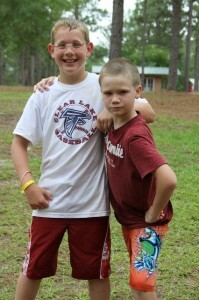 Every year we have a number of children whose parents cannot afford to pay the full camp fee. You can help them to have one of the best weeks of their young lives. To see what a week cost at Camp please see Costs/Refund Policy but of course any amount will be appreciated. All donations are tax deductible. Please mail a check or select the Donate button below to use a credit card or PayPal account. When using the online Application process for your camper, you can add a donation to the total fees. 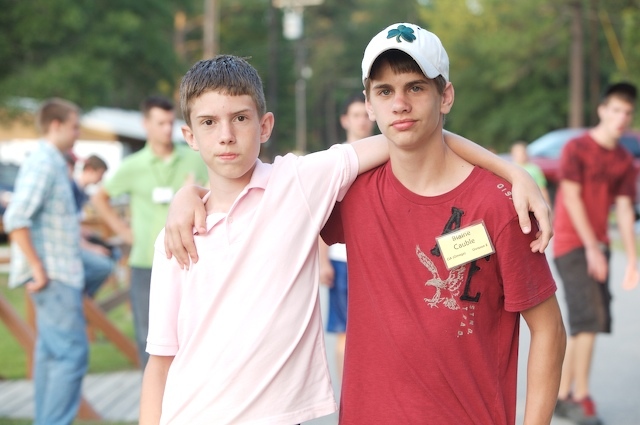 The Camp has a limited fund contributed by generous donors to help campers who do not have the money to attend Camp. If you would like to apply for a Camp Grant, please download the form and return it to us. Please complete/submit this form before applying online for Camp. If approved, you will be emailed a payment coupon that will enable you to complete the payment section of the online application. Q – When will I know if I am accepted or on the waiting list? A – All notifications, both acceptance and waiting list, are emailed on or about May 1. Please do not contact us for this information unless it is well beyond this date. Be on the lookout for the notice. Q – If I am on the waiting list, can I contact the Camp to see what my chances are of getting in? A – No, please do not contact us. We have no way of knowing when and if an opening will occur. We will contact you when we have an opening and you will have a specified time limit to accept or reject. Q – If I am on the waiting list, does contacting the Camp increase my chances of getting in? A – No, please do not contact us. We will contact you when we have an opening and you will have a specified time limit to accept or reject. Q – If I am on the waiting list and I know of a camper who has to cancel, can I contact the Camp to get that vacancy? A – No, please do not contact us. We have several criteria that determine how we fill vacancies. See Application/Acceptance Policy. Q – If the payment for the Camp fees has cleared the credit card company or the bank, does this mean that I am accepted into the Camp? Q – When should all of the money be paid? A — When you apply online, you must use a credit or debit card to make a full payment or you can choose to pay in multiple installments which are automatically charged to your credit or debit card. Q – If I am not accepted, will I get all of my money back? A – Yes! Refunds are usually sent by the second week after Camp. Q – If I decide not to go to Camp, can I get a full refund? A — No! If we are notified by May 7 that you are not coming to Camp, you will receive a full refund less $25 per camper application fee to cover our expenses of receiving and accepting your application. If we are notified after May 7, a full refund less $50 per camper will be sent. If we are notified after June 1, there is no refund. All refunds will be sent after Camp. Submit your requests for a camper roommate on your online application. We do not guarantee that your request will be honored. No requests for a sports team are accepted. Q – Is there a dress code that requires generally longer and looser fitting clothes than is currently popular? A – Generally, yes! Our dress code is not totally based upon the current trends but a collective judgment as to what is modest and what will work the best for one week for campers from a wide range of views. Please plan your clothes in view of our guidelines. For more information, see General Info/Conduct & Dress. Q – Are there any rules or guidelines? Q – Need clarification or our opinion on content? A – Contact us. See General Info/Contact Us. Q – Can I visit my child or friends during the Camp? A – One of the purposes of the Camp is to provide a safe and profitable week for a young person to be away from family and friends (some for the first time) in order to learn self-reliance and to make new friends. Therefore as a general rule, we do not advise visits. Be aware that all campers have a full schedule 24 hours a day and therefore have only a brief time to visit. Your child or friend will have a lot more fun telling you all about their away from home adventure if it is all new to you. For more information, see General Info/Parents’ and Visitors’ Info. Q – What are the phone privileges at the Camp? A – There are no pay phones at the Camp. The local phone company removed them. We restrict all phone calls to emergency calls only. Please do not bring cell phones. Cell phones do not generally work well in the Dry Creek area and we want all campers to be fully involved in the Camp activities. We know every camper who is coming to Camp and will notify the parents of any camper who does not arrive at Camp on Sunday. Therefore no news is good news. Exception: Cell phone cameras may be used in Photography activity. For more information see PackingList.pdf/What Not To Bring. Q – Can I buy only a one way bus fare either to or from the Camp? A – No, we must pay for the bus to go both ways and therefore need the revenue to justify chartering the bus. You may ride the bus only one way as long as we are informed in advance. Q – Can I get off at a different bus stop coming back from Camp? A – Yes, only if we are fully informed in advance and know that this is the will of a parent. We will need this request in writing. For more information see Bus/Maps. Q – When will the nurse be available for a consultation in regards to any special medical needs? A – The nurse will be available during Check In on Sunday afternoon. See General Info/Camp Opening and Closing. If your camper is coming on the bus, contact the Camp (preferably by email) and we will put you in contact with the nurse. See General Info/Contact Us . Q – What if my child does not enjoy sports, is the Camp suitable for them? A – Our sports program is planned and conducted with the understanding that not all children are good at sports. What we ask of all campers is that they participate; even if that means that they would rather participate by cheering for their team. We do not play our games for the benefit of the gifted athlete but with the view of practicing good sportsmanship, win or lose, and everyone having fun doing it together. Q – What if my child is a loner, is the Camp suitable for them? A – All campers are expected to be fully involved on some level in all of our activities. That is to say that the daily major events are not optional but mandatory. There is some free time dispersed throughout the day to be by yourself if you want, but one of the major benefits of the Camp is learning how to interact with others and making new friends. We understand that not all children are as adept in this area as others and we try to help the less sociable camper to be fully involved in the Camp. Therefore we request that all parents discuss thoughtfully with their child whether Camp is for them. A child who is unwilling to interact with others will not be able to take advantage of the major strengths of the Camp. Q – What if my child is prone to be homesick, is the Camp suitable for them? Before Camp, begin to reassure your child that nothing important will change while they are away from home. You will know right where they are and will be there to pick them up after Camp. Note: It is important for you to be on time to pick them up. Reassure them that they, with their counselors help, will be able to take care of their needs. Phone calls can delay the adjustment period of fully participating in the Camp and learning that many fun and good things can happen while away from home. Please do not call your camper directly. Emergency calls must be made to the Office. See Contact Us. Be positive and optimistic with your child knowing that this is just one of many stages of growing into a mature loving person. Please know that if the situation dictates, we will feel free to call you for advice. Click on each text item below to view and/or download a PDF document. Bus Schedule – No Bus This Year! Contact us promptly after Camp, preferably by email. Items are only kept a short time. The Camp has two nurses who serve as first aid volunteers and administer medication schedules. The Camp uses the medical facilities (hospital and medical clinic) in Lake Charles and DeRidder, LA to treat all medical emergencies that require something more than first aid. In the event of a medical emergency requiring more than first aid, we will contact the camper’s parents using the information that the parents’ have provided. All medications that are brought to Camp must be listed on the Medical Form or the Change Medical Form and in their original containers with pharmacy label. All medications that are not “Self Given” will be administered only by the nurses. All campers are covered by a secondary accidental insurance policy which only applies after the parent’s primary insurance policy has been used. The amount of coverage is small and intended only to cover the cost of office visits and simple emergency care. All medical costs not covered by insurance are the responsibility of the camper’s parents/guardians. If anything changes on the Online Medical Form (medications, insurance, contact info, activity restrictions, exposure to communicable disease, etc.) that could not be changed on the Online Medical Form, please download a Medical Change Form. Complete only if needed. Please read the form carefully and follow the instructions to see if you need to complete this form. This form will replace the Medical Form. Bring this form to Camp with you and turn it in to the Nurse. Please Do Not Mail this Form! If you are checking medication with the nurse or you are bringing a Change Medical Form, at Check-In you must go to the cafeteria and see the nurse. All other campers should check in at their assigned Cabin. Change Medical Form – If you need to fill out this form, do not mail it. Bring it with you to Camp. Medication properly labeled. See the medical form for instructions. Be sure to label all luggage with your name and address. Please limit yourself to no more than 2 bags; one large and one small. One bag would be even better since we have so little room in the cabins and on the bus. When using garbage bags for dirty clothes, label the outside so it will not be mistaken for trash!!! Mark your name or initials in each item. Dirty clothes bag – Be sure to put your name or initials on it. Swimsuit (only modest ones, please) and a cover-up robe for going to and from the pool or you can change at the pool. Shirts – Please only modest necklines and arm holes. No one is allowed to wear tank tops, muscle shirts, midriff shirts or very tight fitting clothing. Two pairs of long pants or jeans (see next item). Walking Shorts & Long Pants: – You are permitted to wear loose fitting walking shorts, pants, or skirts which come to the kneecap. If your clothing actually comes the kneecap, you can be assured that its length is appropriate. You must bring at least two pairs of long pants or jeans to wear in case your clothing is judged too short. We ask your cooperation in this matter so that camp can be as harmonious as possible. If you feel that you cannot enjoy camp while abiding by these rules, please allow your spot to be taken by someone who is on our waiting list. We do not consider our rules as the standard for absolute right or wrong, but only as a collective judgment as to how a large number of young people can live in harmony for one week. We lovingly solicit your kind cooperation. Athletic-type shoes should be worn for sports activities. Extra pair of shoes (in case of rain). Sun screen and a hat (especially for those who burn easily) We will be in the sun a lot. Sunday Sack Supper – No Sunday evening meal will be served. Drinks will be sold. $30 spending money – (optional,much less is fine) This should be enough for all Snack Shack and Gift Gallery purchases. For younger Campers – Break up spending money into small amounts. Put it in the packed socks so you will have some each day. Fabric Item to Decorate – If you want to take this craft, come prepared. High Ropes Form – 9-12 graders who want to do the High Ropes. Cell phones do not work well in the Dry Creek area and we want your full involvement in what is happening at Camp. If your parents want you to have a phone for travel security, then the phone must remain in the car or your luggage and unused during Camp. This is a must! It will be enforced! Exception: you may use your cell phone camera for the Photography activity. Radios, stereos, recorders, walkie-talkies, electronic games should be left at home. We will be making our own music and playing together. The only exception to this rule is for equipment brought to be used in the talent show. Jewelry, expensive watches, rings, or other valuables should not be brought. The rooms will not be locked. Water Guns, Shaving Cream, Rubber Bands etc. – No Water Fights Will Be Allowed. All equipment brought for these purposes will be taken up and held. A few overnight rooms are available for parents and visitors. Reservations should be requested for only Thursday or Friday nights. Room: $20 per person/night for adults and children. Contact the Camp via email to reserve a room. All fees are due on arrival at the Camp. Please no “No Shows.” If you can not keep your reservation, please email us so that others can use the room. If you need to pick up your child at some other time than the scheduled closing time on Saturday morning, please notify us in advance. Come first to the Office (in the cafeteria); identify yourself and inform us that your child will be leaving. We will only release the child to a parent or an adult that has been properly authorized by a parent. If more information is needed, contact the Camp. See Info/Contact Us. In case of an emergency, call us at Camp at 337.328.7302. If we are away from the desk, please leave a message. As an alternate, call the Dry Creek Baptist Camp office number, 337.328.7531. If you have suggestions on how to make the Camp better or just need to write to us please email us at: FCDryCreek@gmail.com. Visitors are welcome on Thursday and Friday evenings. Please limit your visits to these times. Parents, please be aware that most older children want to be away from their parents for this one week. It is wise to give them this time. The local phone company has removed all pay phones from the camp ground. Therefore, calling home should be reserved for emergencies only. Also we are asking that campers not bring cell phones. If they must bring a cell phone for travel safety, then the phone must remain in the car and unused during Camp. We know every camper who is coming to Camp and will notify the parents of any camper who does not arrive at Camp on Sunday. Therefore, no news is good news.